Arianee, a Paris based startup, offers a new way of managing digital ownership and authenticity in service of distinctive brands. The underlying idea is a simple one and follows directly from the basics of blockchain technology. An asset is published in a unique chain and is linked directly to a single serial number: the burden of vouching for the authenticity of a product is shared amongst all parties engaged in transactions that concern the product. The fact of its authenticity is shared with the world. The name “Arianee” is the French version of the name of the Greek mythological heroine whom Anglophones call Ariadne. With a thread of glittering jewels, Ariadne is said to have allowed the Athenian, Theseus, to escape the Labyrinth after he had dispatched the Minotaur. The term “Ariadne’s thread” is accordingly in common use in the software world, referencing the exhaustive application of logic to all possible options. “There could be no better name for a structure committed to helping companies and individuals negotiate the internet – a labyrinth whose challenges far exceed those faced by Theseus – than Arianee,” says the white paper. By Ariadne’s aid was found, the thread that traced the way rewound. In less poetic moments the white paper includes some statistics on the rise and costs of counterfeiting and piracy. Working from OECD figures: counterfeiting increased from just 1.9% of the total volume of international trade in 2008 to 2.5% in 2013. In absolute terms, that 2.5% represents more than $460 billion dollars. Digital piracy in films along represented $160 billion that year. Some luxury brands have been very aggressive of late in their pursuit of counterfeiters. But as the white paper observes, prosecuting a party for counterfeit luxury goods, can be a very complicated matter. Arianee sees this problem as its opportunity or, it its words, “the legal paralysis resulting from the complexity … creates an ideal space” for its own efforts. At present, brands maintain customer relationship management (CRM) technologies to track interactions between individuals and the brand’s employees. Unfortunately, the distribution network is fragmentary, and customer records can be unreliable even when (which cannot be taken for granted) they even exist. Further, if brands do manage to communicate with buyers they can find they are talking to the wrong people entirely since a product may have been purchased as a gift, or it may have been resold on a secondary market. For them, even aside from the questions of piracy etc., the ability to track who owns their branded products and to keep open lines of communication with owners will be a great business model advance. The token ARIA is the basis of the Arianee protocol. This is an ERC20 token that will be used to pay for the features on the Arianee protocol that will require payment. ERC-20 defines basic functionality issues such as how tokens are transferred and how users can access data about a token. It also prescribes two signals that each token takes on. Together the functions and signals ensure that Ethereum tokens of various types in the marketplace can work together: almost all wallets that support ether can support ERC-20 compliant tokens, inclusive now of ARIA. The ARIA spent by brands will be used to compensate the authority nodes to whom the consortium model gives a role. Another portion will be reserved for platform maintenance and to seed fund promising third-party ecosystem projects that, it is expected, are in a position to provide exceptional value to the Arianee platform. The rest will go to the third party which facilitated the transaction. Arianee acknowledges that the recent history of cryptocurrencies shows that their value can suffer from wild fluctuations, creating an obstacle for the successful function of blockchain platforms. To provide for this another element, ‘‘Gas,’’ will be used to secure the blockchain and prevent spam and malicious behavior. Specifically, certain transactions on the blockchain (authenticity certification and messaging) will require payment both in ARIA and in Gas. ARIA can be acquired on the Arianee platform or on exchanges, but Gas is going to be distributed to verified brands, verified experts, and owners, at no cost, and on the basis of need. Each user meeting certain minimal criteria will receive a Gas allotment which can be replenished upon depletion. The startup sees its ICO as the opportunity to bond together the members of its community. Accordingly part of the tokens will be going to early users who introduce items that require certification. Frederic Montagnon is chairman of the board. He has founded four companies, exiting from them with a total value of more than $400 million. Montagnon is the 7th largest start-up investor in France, and has been active in the cryptocurrency field for five years, as both investor and influential commentator. The head of business development is Jean-Marc Bellaiche. He is quite familiar with the issue of preserving the value of a brand name: he was formerly senior vice president of Tiffany & Co. He has also been senior partner at the Boston Consulting Group, where he led the BCS luxury, fashion, beauty, and department stores practices. Head of operations: Christian Jorge, a serial entrepreneur in the field of web agencies and e-commerce. Arianee’s advisers include Laurent Salat, the founder of Project Theseus (which certainly keeps matters within the same mythological family). Theseus is a data analysis platform specifically dedicated to blockchains. Fabien Potencier is also involved. Potencier is the founder of Symfony, the PHP web application framework that, beginning in 2004, has helped speed the creation and maintenance of apps and that has replaced competitive coding drudgery. Since Arianee straddles the luxury products and high-tech worlds, it is unsurprising that it draws advisors from both of them. Its advisors with a luxury background include Patricia Barbizet, who became the first woman to head the auction house Christie’s when she was named its CEO in 2014. Fortune has ranked Barbizet number 6 in its list of the 50 most powerful women in EMEA. Those with such a background also include Robert Jan Broer, founder and editor of Fratello Watches, the fine watch aficionado’s website. Broer is also a watch collector of importance. The white paper divides its discussion of the Arianee protocol into three sections, devoted to what it has to offer to, respectively, owners, brands, and the third party community. The owners will be the primary users of the platform. They’re expected to register their products in the “Vaults,” as “Smart-Assets,” whether by listing the products themselves or by taking possession of the Smart-Asset from another user (owner, brand, or retailer). They can then enrich these Smart-Assets via certificates of authenticity delivered by brands, servicing history stamps from expert third parties, and the like. Each Smart-Asset will contain a log that will list all associated events, such as when it has been lent out. Owners can grant the right to third parties or brands to read the data linked to assets in the Vaults. The second type of users critical to an understanding of the protocol are those brands themselves. They won’t have a Vault. What they will have is an Initiate Brand Data Hub. This will provide analytics in three key areas: the management of authenticated products; regular communication with product owners; and interaction with the distribution network (wholesale and retail). Brands are rewarded for their willingness to issue Smart Authenticity certificates, which as we’ve seen enhance the assets in the owners’ vault. The reward, precisely, is that they then become able to send messages to the current owner of the certificate, whether or not that is the initial buyer. Brands can grant the right to third parties to read data in their data hub. By allowing this, the platform allows brands to share different types of information about registered assets. 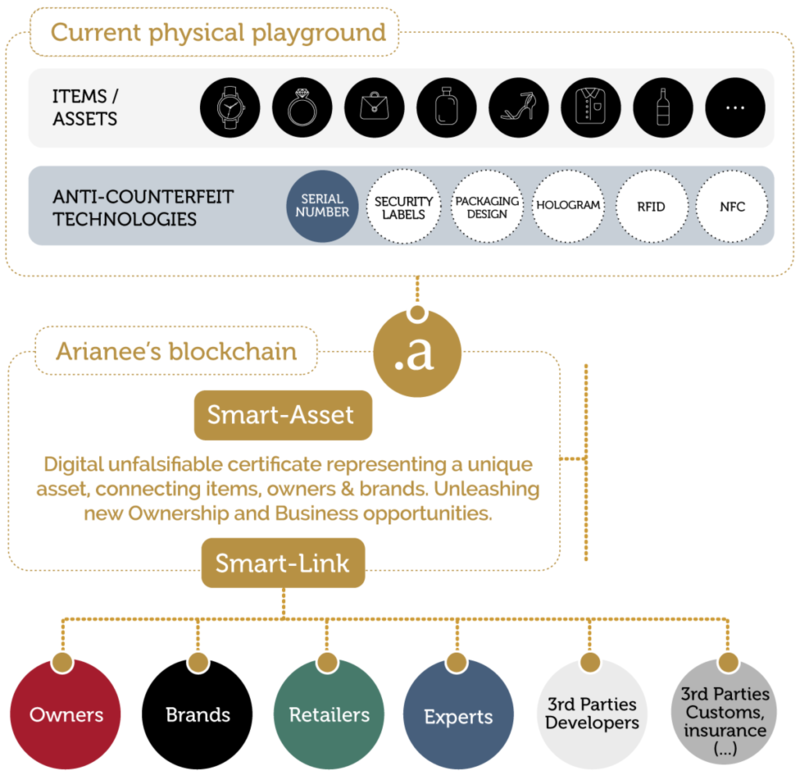 The third type of Arianee user mentioned above is the one with the all-encompassing definition, “third party community.” This includes for example experts outside of the brands, whose appraisals may enrich the products in the owners’ vaults. In order to get an appraisal, an owner will start by searching for “an expert third party who has gone through the Arianee validation process or has received delegation from a verified brand.” The owner can then check the expert’s reputation and grant that party “writing access.” The expert can then add an appraisal certificate to the Smart-Asset in the owner’s vault. More generally, Arianee expects that “enriching third parties” will develop apps (or, to be precise, Dapps) that will leverage the blockchain. The platform will be of great benefit to insurance companies. In case of theft of or damage to an insured item that is on the platform, the insuring company will be in a position to verify authenticity and ownership, as well as to establish an accurate repair or replacement cost. They will also be in an improved position to monitor and protect themselves from insurance fraud. To get insurance, a product owner will first grant the insurer a “read access,” either to its entire vault or to the selected assets for which insurance is desired. The insurer may then use the certificates of ownership and authenticity in the vault to estimate the value of the products involved, and thus the appropriate premium. Another third party beneficiary of the platform is the IT service provider who will find itself a “necessary bridge between legacy IT systems and the Arianee blockchain. As the white paper observes, there are three distinct blockchain models. The first, the paradigmatic blockchain, is the “public blockchain,” designed to cut out intermediaries so that everything becomes peer-to-peer. This is what Satoshi Nakamoto was doing in creating Bitcoin, after all. In such a system, every transaction has to be verified and synched with every node, and anyone “with a computer connected to the internet can set him-herself up as a node.” This is much of the charm of the new technology, but it also has its limitations. Transactions get slower and more costly as the network grows. An obvious response is to bring intermediaries back in, to some degree, with a “private blockchain.” Write permissions can be centralized to a single authority, and read permissions can be restricted to greater or lesser degree as the needs of the system seem to require. The generally involves one central “miner” of tokens. Vitalik Buterin, of Ethereum, has described a typical private blockchain as “a traditional centralized system with a degree of cryptographic auditability attached.” This makes it subject to security breaches and it raises the issue of trust. It the context of something akin to the Arianee platform, it cannot be assumed that the owners or brands or other parties involved are going to trust the central authority. That may send one back to the public model, which requires no trust given the redundancy built into it. But there is a third model, the consortium blockchain. This is an effort to preserve the pluses of each of the other two models. The mining of tokens is decentralized, though there is a miner selection process. There is also a voting or multi-party consensus mechanism (rather than the ‘proof of work’ or “proof of stake’ consensus of public blockchains). Transactions are approved at very short intervals, 100 times a msec. It is the consortium blockchain model than, Arianee says, is “more specifically aligned with our needs” than either of the others. The white paper also references the Ethereum Metropolis (Byzantium) upgrade late last year, which added a new cryptographic tool to the blockchain, the zk-SNARKs. The lower case “zk” refers to “zero knowledge.” This (zk) refers to any method by which one party on a blockchain can prove to another that something is the case without revealing any information other THAN the fact that this something is the case. The gist of the paper’s discussion of zk-SNARK seems to be simply to demonstrate to readers the determination of the Arianee team to stay at the cutting edge of developments in a quickly changing technological setting. The Arianee website indicates that the founding team first came together in the third quarter of 2017. By the first quarter of 2018, Arianee had its extended team. The second quarter saw a roadshow in which this team sought to build a community and spark awareness of the needs that the platform will meet. Going forward: Arianee plans to launch its TestNet and brands workshops in 2018 4Q. The first quarter of next year will see the protocol beta. Then, in 2019 2Q, the platform will go live. Arianee has not yet announced dates for the various rounds of the ICO. US persons are prohibited from participating. As is customary there will be a Round 0 [private sale, to core members and advisors only], a Round 1 [broader participation but by invitation only], and a Round 2 [public sale]. The total ICO won’t last longer than 18 weeks. There is no hard cap yet for the token sale — one will be set after Round 0. The soft cap is $20 million. For the public sale the price will be 5,000 satoshi per token. A satoshi is the smallest fraction of a bitcoin currently in use, a hundredth of a million BTC. There is a minimum 30% discount from this price in Round 0 ad a 20% discount in round one. Arianee’s governance system is a little unusual, a by-product of the fact as noted above that it uses the consortium blockchain model, mixing and matching features of the public and private models. Arianee’s governance consists of: an executive board, a protocol board, and enterprise committees. They all can be said to supplement the Proof of Authority protocol, the machine-based consensus seeking mechanism that will certify the integrity of the blockchain. The protocol board will be making decisions concerning the development and maintenance of the protocol as described above. Its mandate is to ensure the independence of the network, and the balance of power among authority nodes. The enterprise committees will give voice to the businesses using the protocol. Each particular business sector involved in the ecosystem gets its own committee, to service the needs of its users, and each committee shall elect a representative to participate in the meetings of the protocol board. Governance also entails a Know Your Business process through which every brand, expert, and independent authority node operator will be verified. Only verified companies will have access to the paid features of the system. The verification process will be run by another governance body known as the “Network Onboarding Circle,” and will be approved by the protocol board. The working paper discloses a fascinating business plan. And certainly the luxury goods markets — as well as other markets that might not fit into that designation but could be brought into the same system of authentication over time — is likely to support measures that will make life more difficult for counterfeiters, black marketers, or grey markets either. But there are a couple of matters that may give some readers pause. First, Arianee seems not yet to be willing or able to name any brands that have committed to the system. Second, the white paper is not all that clear on what role the “Gas” is supposed to play and how that is supposed to be accomplished. Yes, it is clear that Arianee acknowledges the volatility of ETH, and so in advance of ARIA as an ERC-20 token, It says that the Gas is introduced to resolve the problems that volatility would otherwise create, but it isn’t immediately clear how that resolution is to work. Here we conclude, and perhaps instead of Ovid we might quote the simple words of Nathaniel Hawthorne, in his Tanglewood Tales: “Eager to let Ariadne know of his success, he [Theseus] followed the guidance of the thread, and soon found himself at the entrance of the Labyrinth.” We have come a long way and you, dear reader, may now boast of your success to the Ariadnes of your life.